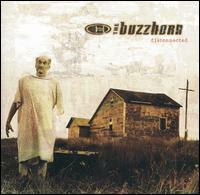 The Buzzhorn, a quartet hailing from Milwaukee, WI, are certainly not metal. They fall into today's popular post-grunge, heavy alterna-rock category that clogs the airwaves of America. What makes this band different, and therefore worthy of mention on this site, is their ability to stand above the pack and bring a breath of freshness to what has become a nearly intolerable genre of music. Having been compared to Alice In Chains, Puddle of Mudd, and Monster Magnet, this band actually walks a line which incorporates the best elements of the aforementioned acts. Relying on solid riffing and anthemic choruses, and plenty of distortion, The Buzzhorn has put together a solid major-label debut. Disconnected is an album which itself walks a line between a heavy, aggressive alterna-metal sound and a sort of Matchbox 20 or 3 Doors Down lethargy. I would like to think the band will focus on the former direction, but being signed to a major label will most assuredly keep the band's creative input to a minimum. Of course I favor the heavier tracks, and it's quite hard to pick one out as a favorite. Each is really unique, blending common elements in creative mixtures to produce fresh sounding tunes on nearly every track. If you're a fan of any of the bands I mentioned above, or are interested in some solid groove-oriented modern rock, this is an album that won't let you down.